India 5-337 (Virat Kohli 144, Dinesh Karthik 106*, Shaminda Eranga 2-60) beat Sri Lanka 3-333 (Tillakaratne Dilshan 84, Kusal Perera 82, Ishant Sharma 1-41) by five wickets. The Islanders scored 333 runs for the loss of just three wickets at the end of the stipulated 50th over and the Blue Shirts achieved the target by amassing 337 with five wickets in hand and six balls to spare. The ICC Champions Trophy Warm up Match 2013 season was played on Saturday, June 1, 2013 at Edgbaston, Birmingham. 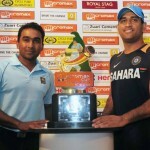 Earlier, the skipper of India, MS Dhoni, won the toss and put the Lankan Lions into bat first. Kusal Perera and Tillakaratne Dilshan opened up aggressively by scoring 59 runs in the first 8 overs with 9 fours and 1 six. Perera got 14 runs in the next over with a couple of sixes and reached his fifty two overs later. Dilshan kept on scoring boundaries at his end and attained his half century in the 21st over. The openers took the score to 160 after 26 overs when Kusal Perera was retired hurt for 82 off 94 balls with 3 lofty sixes and 7 fours. Mahela Jayawardene walked in next as Dilshan added another 2 fours in the 31st over and was retired hurt as well at 195 after contributing 84 from 78 deliveries with 1 six and 9 fours. The next batsman Kumar Sangakkara was dropped at 1 by Vinay Kumar at his own bowling as the score board displayed 200 runs in the 33rd over. The first wicket fell at 209 as Jayawardene was caught by Irfan Pathan at short fine leg off Ishant Sharma for 30. Dinesh Chandimal appeared in next as Sangakkara hit 6 boundaries in the coming overs followed by 3 from the first. Kumar Sangakkara was caught by Ravichandran Ashwin off Amit Mishra for 45 in the 44th over and Chandimal was caught behind by MS Dhoni off Bhuvneshwar Kumar for 46 in the final over. Thisara Perera was at the crease with 26 as Sri Lanka piled up 333 runs with seven wickets in hand in 50 overs. India lost their first wicket at one as Virat Kohli joined in with Murali Vijay and both batsmen started playing their shots from the beginning. Vijay became the second victim at 52 in 9.5 overs for 18 and the next batsman, Rohit Sharma, scored just five runs. Suresh Raina got together with Kohli and they kept the score board running in the following overs. The score was enhanced to 110 in 20.3 overs as Sharma was clean bowled by Sachithra Senanayake for 34. Dinesh Karthik associated with Virat Kohli who attained his fifty in the 23rd over. The duo slowed down a bit in the process but picked up the run rate from the 28th over and hit 6 fours and 1 six until the 30th over. Karthik got his half century in the 32nd over with a six and the total crossed the 200 runs mark in the 35th over. Kohli continued with his assault, he thrashed his hundred two overs later and added another 2 sixes and 4 fours later in the innings. He was finally gone for 144 off 120 balls with 3 huge sixes and 11 fours. MS Dhoni took guard next as Dinesh Karthik smashed his century on the first ball of the 49th over and remained unbeaten for 106 off 81 with 2 giant sixes and 12 fours. Dhoni was at the other end for 18 as the Blue Shirts hammered 337 after losing five wickets in 49 overs. Shaminda Eranga was the top wicket taker with two whereas Thisara Perera and Sachithra Senanayake shared one wicket each. India won the interesting battle with a big margin of five wickets and must have gained a lot of confidence before the start of the 2013, ICC Champions Trophy.